IBF No. 1 heavyweight contender Kubrat 'The Cobra' Pulev of Bulgaria recovers from a nasty cut above his left eye to stop a game Bogdan Dinu of Romania at The Hangar in Costa Mesa, CA Saturday night (Sunday in Manila) and remain on course to challenge British heavyweight champion Anthony Joshua. Dinu connected a lethal right to the head of Pulev in the 4th round inflicting a nasty cut above the left eye of Pulev resulting in a lot of blood dripping to his face and splattered all over the ring. 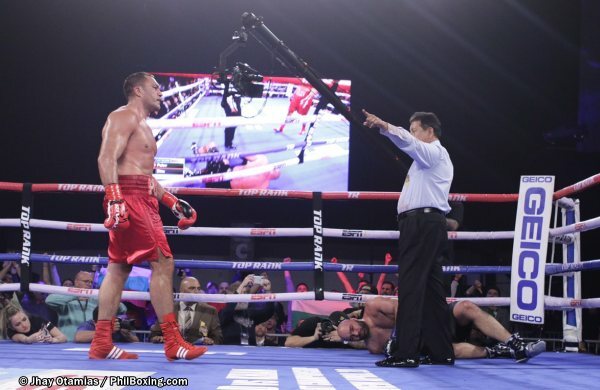 Pulev's cutman Eddie Hernandez was able to control the cut but it immediately opened up when the action continued in round five as Pulev, sensing that the fight could be stopped at any time, went for broke as Dinu slowed down. 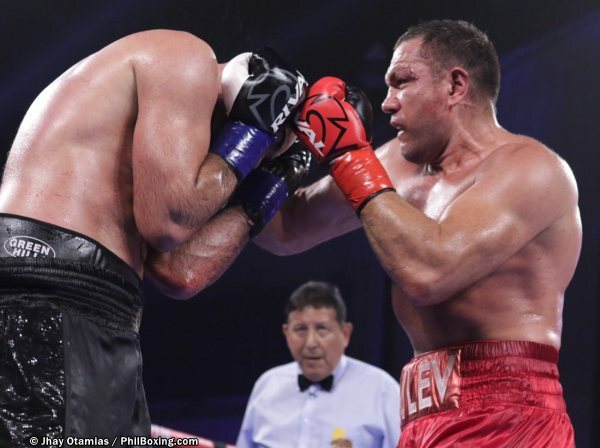 Pulev continued to push the pressure in the sixth badgering Dinu with a looping right to the head until finally, in the 7th round, Dinu gave in to the pressure and went down. 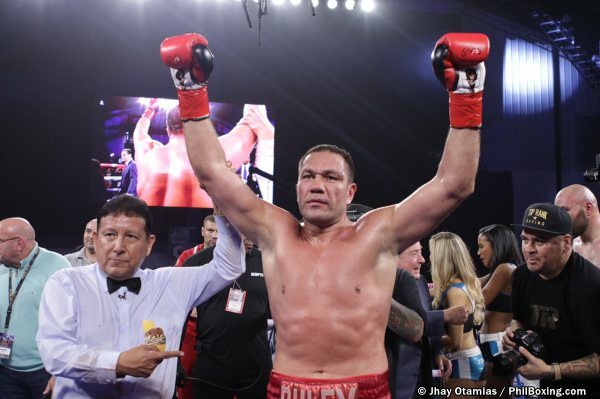 Pulev however, connected with an extra punch behind the head as Dinu was already in the canvas, forcing veteran referee Raul Caiz Sr to pause the contest and deduct Pulev a point and gave enough time for Dinu to recover. When the action resumes, Pulev continued to press and sent Dinu to the canvas the second time. And when Dinu got up at the count of 10, Pulev wasted no time and put Dinu back again to the canvas for good. Time: 2:40 of the 7th round. Pulev, who risked his No. 1 rating against Dinu, thus pulled a dramatic comeback and is now looking forward to challenge reigning IBF heavyweight champion Anthony Joshua in the near future.